The mission is simple: serve delicious, affordable food that everyone will want to enjoy week after week. The Guarani name for this specialty is Mbaipy Abatí, which means Dry Corn Polenta, and Sopa Paraguaya in Spanish. The only explanation I have as to why this torte or cornbread is called sopa (soup) in Paraguay is that the corn mixture that goes into the oven is almost soupy. Sopa Paraguaya is the most popular specialty in Paraguay. It is the traditional dish served at weddings, holidays and special occasions. On Good Friday, especially in the rural areas, it is the standard fare in every home. The classic Sopa Paraguaya does not have fresh corn in it; although some cooks add it for a lighter texture and flavor. There is also a version called Sopa Paraguaya Rellena, filled with a savory mix made with meat or chicken. The cheese generally used in Paraguay is a fresh cheese that is not available in this country. The usual substitute is a combination of farmer’s cheese or ricotta with any Mexican white cheese. 1. In a small saucepan combine onion, water and salt; bring it to a boil and simmer covered for 10 minutes. Set aside to cool. 2. In the large bowl of an electric mixer cream butter. While beating add yolks, one at a time; mix in cheese and corn. Fold in onions with its liquid and then cornmeal, a third at a time alternating with buttermilk. 3. Beat egg whites until they hold soft peaks, then carefully fold into cornmeal mixture. Transfer to a well- buttered and floured 2-1/2 quart casserole or rectangular baking pan and bake in a preheated 400°F oven for 45 minutes or until golden brown. Cool for 5 minutes, cut into squares and serve. This torte is at its best when eaten right out of the oven, but it is also good reheated. I usually freeze the leftovers and reheat in the microwave. This cornbread is great for breakfast with a good cup of coffee. 4. Top with a dollop of cream and fruit of choice. NOTE: More Paraguayan recipes can be found in The South American Table, By Maria Baez Kijac. In an electric mixer cream butter and sugar, stir in water, vanilla extract, then flour. Shape about 1 teaspoon of the dough into small crescents, about 1/2 inch thick. Bake on ungreased cookie sheets in a preheated 250 F oven for 30 minutes. Cool for a couple of minutes and while still warm roll in the extra confectioners' sugar. Cool in racks. My version of this holiday classic uses only 1-1/2 ounces of bittersweet chocolate per cup of milk, but for chocoholics I use 2 ounces chocolate and no sugar, with a small amount of chili powder to give a little kick. You can use 2 % milk, whole milk, or like some versions I’ve seen, half and half. Let your conscience be your guide. 1. In a heavy 2-quart saucepan, mix milk, chocolate pieces and chili powder. Bring to a boil over very low heat, whisking often so it doesn’t stick to the bottom. When the chocolate has completely melted, increase the heat to medium and bring to a quick boil, whisking all the time. After a couple of minutes, foam will start rising. Remove pan from the heat before foam reaches the top of the saucepan and continue beating. When the foam has gone down, put the saucepan back on the heat and continue whisking for a couple of minutes When it foams again, remove from the heat, continue beating, if you are lucky, you will be able to get the foam to stay. Mexican cooks are famous for serving their hot chocolate with a lot of foam. Stir in vanilla extract. 2. Ladle into small coffee cups or mugs if you are serving 8-ounce portions. Add a dollop of whipped cream, if desired, and serve immediately. As the chocolate cools, it will thicken. Depending on what else you are serving, a 4-ounce portion may be enough, as this chocolate is quite rich, especially if you use 2 ounces of chocolate per cup and whole milk. Good opportunity to use your demitasse cups. One of the most popular ceviches in Ecuador is ceviche de camarones, usually made with shrimp or langostinos (prawns). Also popular is the ceviche de hongos and the ceviche de palmito. Sometimes I combine two of these ingredients like in this case, to give an extra dimension. Ceviches in Ecuador are always served with maíz tostado (toasted dry corn) or popcorn, plantain chips and French bread on the side, along with a bowl of ají (hot sauce), for those who like their food more fiery. This citrus marinade can be used as a basis for different types of ceviches, such as Mushroom Ceviches, Hearts of Palm Ceviches or others that use shrimp with a mixture of vegetables. 1. To cook the shrimp, bring 4 cups water to a boil in a medium saucepan. Add shrimp, remove from the heat, let stand for a few seconds until shrimp turns pink and starts to curl. Drain and rinse with cold water to stop the cooking and make the shrimp crunchy. Cut each shrimp in half across and transfer to a covered plastic or glass container. Refrigerate until needed. 2. Drain hearts of palm, rinse and cut each piece into 8 rounds Reserve with the shrimp. 3. Cook tomatoes in 1/2 cup boiling water for 5 minutes. Drain, rinse with cold water, skin, seed and puree in a blender or food processor. Pass through a sieve. 4. In a glass bowl mix tomato puree, lemon and orange juice, ketchup, olive oil, salt, black pepper and hot pepper sauce. Taste and add a little lemon or orange juice to balance flavor, if needed. None of these flavors should be too pronounced and you might have to add a little sugar if tomatoes are too acidic. More hot sauce is provided on the side for people who like hot ceviches. Marinade can be made the day before and kept refrigerated. Two to four hours before serving mix cilantro, cebollas, shrimp and hearts of palm with the marinade, taste and add salt or sugar if needed. Chill. 5. Serve in small bowls or stem glasses, garnished with a teaspoon of the remaining onions and a sprig of parsley. Bowls of popcorn and hot sauce are served on the side to be added to the ceviche by the guests. French bread and optional plantain chips are also served in bowls. Red onions prepared this way are a must for Ecuadorian ceviches. Prepare them about 4 hours before serving. You will need half of them to add to the ceviche 2 hours before serving. Pour boiling water over onions and let stand for 5 minutes. Drain and rinse with cold water. Toss with lemon juice, salt and pepper, cover and refrigerate until needed. This should be done about 3 hours ahead too give time to the onions to turn pink. This was one of my mother’s favorite first courses for dinner parties. Of course, the puff pastry was always made at home. I remember my younger sister Ximena loved to make puff pastry, I think she was 10 years old when she learned how to make this dough. These empanadas were also a favorite of my cooking class students, and they are always a treat for family and friends, whether they are made in the large size for lunch or the hors d’oeuvre size. The bonus—they freeze beautifully. To accommodate today’s busy schedules, I often rely on ready-made puff pastry, as in this version of the dish. In a large skillet, melt butter over medium heat. Add mushrooms and scallions and sauté until all juices from the mushrooms have evaporated. Add cream, and cook until reduced enough to just coat the mushrooms. Remove from the heat, season with salt and pepper to taste, toss with bread crumbs and parsley or dill. Cool and mix with cheese. Assemble the turnovers. Remove 1 pastry shell and roll it out on lightly floured work surface into a 5" to 6" circle. Place 2 heaping tablespoons of the filling in the center of the circle and lightly the moisten the edge of the half of the circle with the egg mixture. Fold the round in half and press firmly to seal the edges. Crimp the edge with a fork dipped in flour, and pierce the top with the fork to allow steam to escape. Repeat with the remaining shells and filling, then refrigerate for 10 minutes before baking. Bake in the upper third of a preheated 375°F oven for 25 minutes or until golden brown. Cool for a few minutes and serve. These fritters are the classic Christmas dessert in Ecuador. Similar fritters are found in other Latin American countries under different names such as sopapillas, picarones, depending on the country. Some are made with yeast instead of baking powder and are mixed with pureed squash. Place flour, baking powder, sugar and salt in the bowl of the food processor, and pulse to mix. Add butter, pulse until it looks like coarse meal. Add eggs and liqueur, and process until it forms a ball. (If preparing by hand mix the flour with baking powder, sugar and salt. 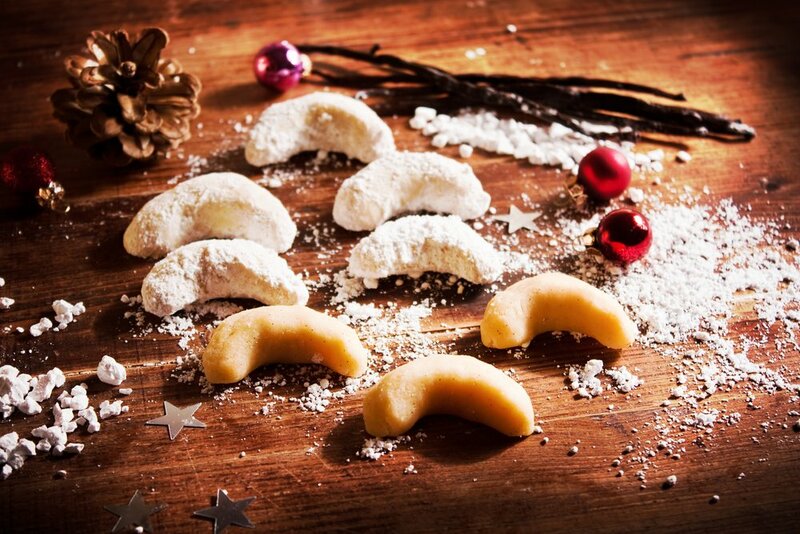 Mix with butter, eggs and liqueur, kneading until dough forms bubbles.) Cover dough with plastic wrap and let it rest for 30 minutes at room temperature. Roll dough into a cylinder, cut in two, then cut each half cylinder into eight pieces. Roll each piece into a strip about 2 x 6 inches. With scissors, make diagonal cuts on one side about halfway across the strip—about four cuts. Press ends together to form a wreath. Heat about 1-inch of oil in a frying pan to 360°F. Drop 2 or 3 wreaths at a time and fry swishing the oil with a large slotted spoon over the wreaths. Fry on both sides until golden, then drain on paper towels. They are best served right away with Miel de Panela (recipe follows). Otherwise serve them at room temperature. Adapted from “The South American Table” published in 2003 by Harvard Common Press. This Paraguayan corn torte is one of the classic examples of what one can do with corn. I especially like this rendition because of its versatility! It can be used as a main course for a meatless meal, as part of a buffet, or as a side dish for any kind of fish or meat. Either way, it is always a winner! 1. In a small frying pan heat butter and oil over medium low heat. Add onions and sauté until soft, about 20 minutes, stirring occasionally so they don’t brown. Let cool to lukewarm. 2. In a large bowl mix corn meal, salt, sugar and baking powder, set aside. 3. In a blender or food processor puree corn with milk. Mix with egg yolks for a few seconds and add to dry ingredients together with the cheese. Mix well. 4. In a separate bowl beat the egg whites until stiff but not dry. Carefully fold into the corn mixture. Turn into a 7x11-inch buttered baking dish and bake in the middle of a preheated 350-degree oven for 1 hour. Let cool for a few minutes, cut into six slices and serve. This type of salad is common is many Latin American countries with variations. Some cooks use black olives to garnish the dish. Picture was contributed by Yvonne Reyes. 1. Place the well-drained tomatoes, onions and jalapeño pepper in a salad bowl. 2. In a small bowl beat oil with vinegar or lemon, salt and pepper until emulsified andpour over tomatoes and onions and sprinkle with cilantro, basil or parsley. 3. Serve in a glass bowl or platter garnished with black olives, if desired. This particular recipe was inspired by a sweet quinoa tamale found in my native Ecuador. Here, cinnamon combines with cloves and anise to give these moist, cakelike bars a decided holiday tone. But even though they’re perfect for the holidays, they are versatile enough to suit any occasion. Stamina seekers, from hikers to woodchoppers, will especially appreciate the mix of nuts and dried fruit. A certain winner with anyone, these nutritious bars will quickly disappear from your serving platter. 2. Put quinoa and water in saucepan, bring to a boil, and cook for 12 minutes or until all the water has been absorbed. Remove from the heat, fluff with a fork, cover, and let cool. 3. In a large mixing bowl, combine sugar, rice flour, baking powder, baking soda, cinnamon, cloves, nutmeg, anise seeds, raisins, apricots, walnuts, and Basic Boiled Kañiwa; mix well. Add cooked quinoa, butter, orange juice, vanilla, and eggs, and mix thoroughly. Transfer to a buttered and floured 13" × 9" baking pan. 4. Bake in the upper third of the oven for 45 minutes, or until a toothpick inserted in the center comes out clean. Cool on a wire rack. 5. Cut into 24 bars. If desired, dust with confectioners’ sugar before serving. completely melted, increase the heat to medium and bring to a quick boil, whisking all the time. from the heat, continue beating, if you are lucky, you will be able to get the foam to stay. whipped cream, if desired, and serve immediately. As the chocolate cools, it will thicken. The original recipe appeared in the Art of Cooking with Quinoa and later on was adapted to this version, which my daughter Stephanie made for a party. The combination of flavors and textures, as well as the eye appeal, will make this refreshing salad a favorite for the buffet table. Instead of shrimp you can use diced cooked chicken, turkey or ham. You can also change some of the ingredients according to availability and preference. You can find in my latest book Cooking with Ancient Grains published by Adams Media 2014 a variety of beautiful salads that use the latest ingredients such as colorful grape tomatoes that you can use in this salad instead of the garnish - just toss and serve. 1. Place rice in a fine mesh strainer and rinse thoroughly. Transfer to a 4-quart saucepan, add the bay leaf and 3 cups of the water, and bring to a boil. Add salt to taste, reduce the heat to medium-low, and simmer, covered, until the rice is tender, about 45 minutes. Drain, discard the bay leaf, return to pan, cover with a kitchen towel and set aside to dry for 5 minutes. 2. Place quinoa in a fine mesh strainer and rinse thoroughly with cold running water until water runs clear. In a medium-size saucepan, bring the remaining 3 cups water to a boil, add the quinoa, and cook until the grains are transparent throughout, about 12 minutes. Drain well and return to the saucepan. Cover with a kitchen towel and set aside to dry for 5 minutes; toss with a fork, transfer to a mixing bowl to cool. 4. In a small mixing bowl, beat the dressing ingredients together with a small wire whisk until the mixture thickens. Toss the salad with the vinaigrette to taste. Taste again for salt and pepper to taste. Cover with plastic wrap refrigerate until needed. 5. Serve chilled, garnished with the tomato wedges. For optional shrimp, which I call for in several recipes, the best way to give good flavor to the shrimp is to marinate as shown below. My experience is that most people really appreciate if the salads have shrimp as one of the ingredients, if shrimp is part of their diet. Keep in mind this recipe calls for only 1//2 a pound of shrimp.. NOTE; To make preparation easier cook rice and quinoa the day before, and while they are cooking get vegetables ready. Refrigerate all ingredients until needed. *Lupine beans are found in the Italian section of supermarkets and are very rich in calcium. In a large mixing bowl, combine flour and optional salt. Add water and stir with a wooden spoon to make a soft dough. Let stand for 5 minutes, covered with plastic wrap, then knead for 3 minutes. Dough is ready to be shaped into standard arepas, or to be mixed and kneaded with other ingredients such as cheese, chicharrones (pork rind), etc. The standard Venezuelan arepa is 3 inches in diameter and 3/4-inch thick. Colombian arepas are larger and thinner, about 4-inches in diameter and 1/4-inch thick. To make arepas, oil or wet hands lightly and shape dough into balls. Place between 2 pieces of wax paper or plastic wrap and flatten into a circle; shape the edges to form a smooth disk. In Colombian , arepas are often made using a small wooden press, a utensil that is also used to flatten disks of cooked plantain to make patacones. These presses are available in some Latin American grocery stores. Heat a griddle or cast iron skillet over medium heat; grease lightly and cook arepas on both sides, turning a couple of times until crust is formed. If arepas are browning too fast, reduce heat to low. It takes about 10 to 15 minutes. Colombian arepas are ready to be served at this point. Venezuelan arepas have to be baked in a preheated 350°F oven for 15 minutes. To check for doneness, tap the arepa lightly—if a hollow sound is heard, it is ready. Split open, add butter or cream cheese and serve hot. A common way to enhance arepas that was made possible by the introduction of dairy from Europe is the addition of cheese. Just add one cup of shredded cheese (any good, hard cheese, such as cheddar) to the dough, and kneed thoroughly before cooking.